In recent years, the health care world was heavily focused on developing and finding a cure for hepatitis C,a bloodborne infection affecting nearly 3.9 million people in the U.S.1 With the advent of therapies with cure rates more than 90 percent for hepatitis C, medical professionals now predict a shift in industry focus to the leading cause of liver disease in Americans, nonalcoholic steatohepatitis, or NASH.1. NASH is a subcategory of a larger condition called nonalcoholic fatty liver disease (NAFLD), which involves excess fat buildup in the liver. Unlike NAFLD, NASH patients also experience liver tissue inflammation which can lead to scarring or fibrosis. Damage to liver cells from prolonged exposure to a disease or a substance can lead to impaired function, cancer or liver failure. Cirrhosis is a severe condition where normal healthy liver tissue is permanently replaced by damaged scar tissue thereby preventing proper function. This can be caused by a variety of things including alcohol, medications and infections. As the name suggests, both NAFLD and NASH are not caused by alcohol, but instead, are closely associated with obesity, diabetes, high blood pressure and high cholesterol. It is estimated about 3-to-12 percent of adult Americans are diagnosed with NASH. significant symptoms. Unfortunately, if NASH is left untreated, the scarring can progress to more severe cirrhosis which can develop into liver cancer or liver failure. How do we treat NASH? Despite the extensive history of this disease, there are no FDA-approved NASH drug treatments currently. 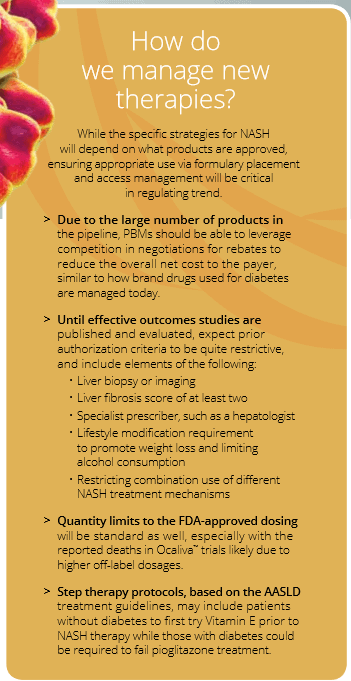 According to guidelines by the American Association for the Study of Liver Diseases (AASLD), dietary and lifestyle modifications remain the mainstay of both prevention and treatment of NASH. Some pharmacological agents such as Vitamin E and the diabetes treatment, pioglitazone (Actos®), have shown some benefit in NASH patients by reducing inflammation and fat buildup. However, neither treatments have been properly tested for long term safety and efficacy in NASH. As the focus on NASH grows, a better understanding of the disease pathways has led to a surge of development for drugs that will target these various mechanisms. As of May 2018, there are roughly 48 NASH drugs undergoing clinical trials with about a dozen likely to enter the market in the next couple of years.6 As these products are approved, marketing of these drugs will cause a heightened awareness of the disease, which will lead to increased demand of these novel drugs. The challenge lies in determining who to treat and how to properly use these different medications, which will be greatly impacted by the yet-to-be-determined price of the therapies as well. Another key factor in controlling NASH spend will come from disease management programs. Not only can trained professionals aid in adherence to the potential strategies listed above, but they can provide support in patient education of the new condition as well as assist in navigating the various drug dispensing channels. This will be even more critical for patients taking multiple NASH medications, which can vary from intravenous infusion in a specialty setting to the traditional oral medication. For the past few years, the term NASH has been quietly tossed around as the next big disease state in the health care community. We are quickly approaching the years where it will be loudly discussed by those footing the bill for treatment of this highly prevalent condition, especially by those without sound clinical and financial management. In his role as a pharmacy resident, Kevin works closely with the director of pharmacy to serve as a clinical resource for our members’ benefits professionals on topics of new drugs, plan design recommendations and overall trends.